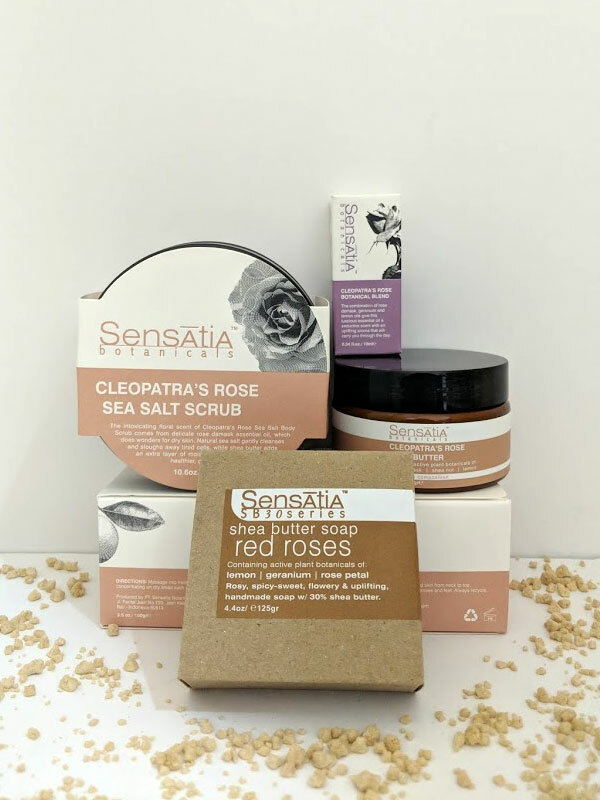 The intoxicating ﬂoral scent of Cleopatra’s Rose Sea Salt Body Scrub comes from delicate rose damask essential oil which does wonders for dry skin. Natural sea salt gently cleanses and sloughs away tired cells, while Shea butter adds an extra layer of moisture that contributes to healthier and glowing skin. Mild enough for all skin types, yet particularly nourishing for dry, sensitive skin, Cleopatra’s Rose Body Butter is an intensely hydrating body moisturizer. Formulated with creamy shea butter and rose damask oil, this rich body butter pampers skin, leaving it lightly scented with an alluring ﬂoral aroma. Boasting an intoxicating ﬂoral aroma, Red Roses Shea Butter Soap contains rose damask essential oil and creamy shea butter, which makes it particularly nourishing for dry and sensitive skin. Geranium and lemon essential oils add to the seductive bouquet and have a brightening effect on tired, dull skin. The combination of rose damask, geranium and lemon oils give this luscious essential oil a seductive scent ﬁt for Cleopatra herself. Add a few drops to warm water for a luxurious, skin-soothing bath that gently perfumes skin with an uplifting aroma that will carry you through the day.